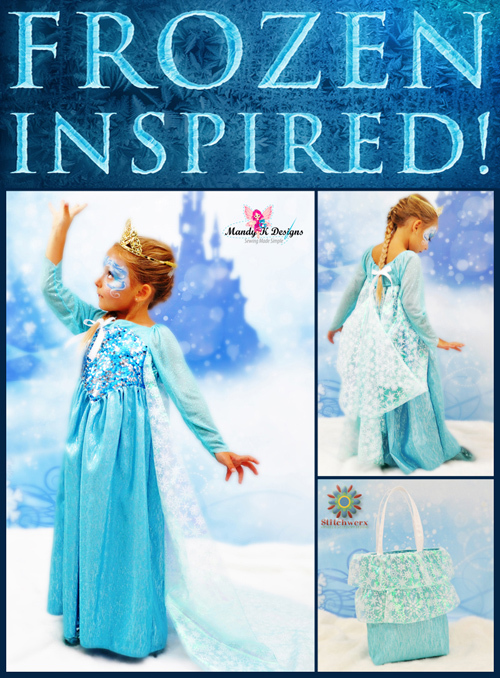 On Day Two of our Frozen Inspired Celebration and Giveaway, we are featuring an Ice Princess Dress inspired by Elsa. I used the Princess Party Dress Pattern from Mandy K Designs to make this stunning gown for our sweet little Ice Princess! 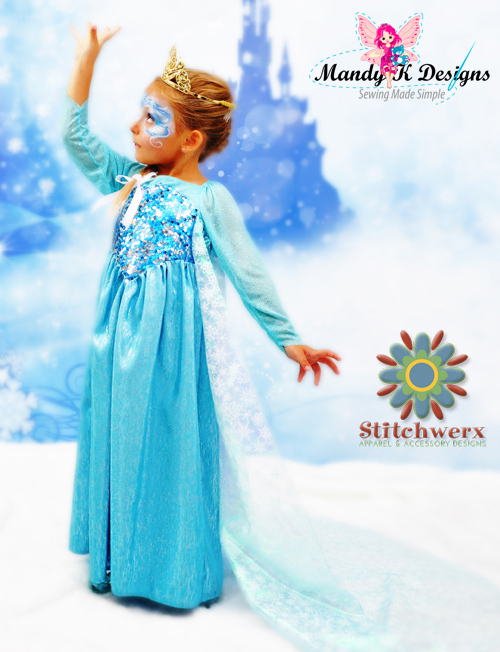 This is such a versatile pattern that is perfect for making a variety of Princess Dresses! The Princess Party Dress Pattern Sale continues through September 30, 2014. Save over 40% off the regular price when you purchase it here for Only $5: Mandy K Designs Princess Party Dress. I made very little changes to the original pattern when making our Ice Princess Dress. After consulting with my girl (a Princess knows what she wants), we decided to make the sleeves a bit more tapered and have points that came down on the top of the hands. I used the original sleeve measurements in the pattern to help me draft a slightly revised version. We also wanted our dress to be floor length. Mandy’s pattern gives measurements for a knee length dress and instructions to calculate the correct skirt measurement if you want it longer. That made my job so much easier! Since Elsa has a very long cape, we also wanted our cape to be extra long. I ordered 2 yards of this beautiful snowflake organza for our cape and used it all. I cut the bottom in a curve so it makes quite a stunning train. For practical purposes, we could not have this long cape dragging the ground all the time, so I added a cute little snowflake button in the back and sewed a loop on the cape so we could bustle it up. This will make it super easy for our little Ice Princess to haul in the candy during Trick-or-Treating! I love how fast this dress was to make and, with the elastic at the neckline and waist, the fit is great! My girl also likes how simple it is to put on and take off. She said it’s super comfortable and really did not want to take it off after the photo shoot! I did quite a bit of research to find inspiration for the perfect Ice Princess face. 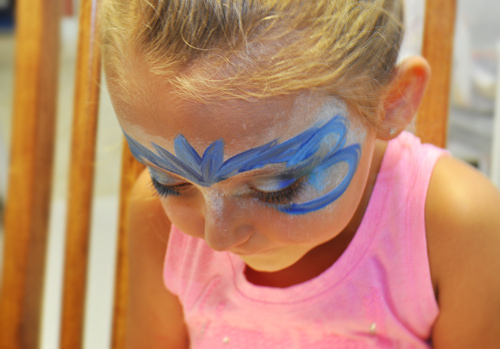 I was a tad rusty with my face painting skills, so we practiced a few times before the actual day of the shoot. Luckily my girl was very good at sitting still (and we took a few breaks along the way)! The face of an Ice Princess! My Little Princess does not quite have the hair that Elsa does, so we used hair extensions to make her braid nice and long. 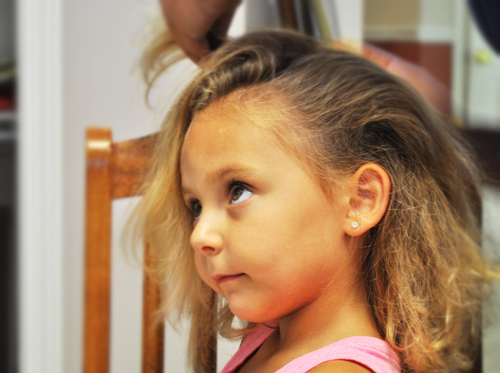 Thanks Aunt Jamey for the excellent hair braiding! As I said in yesterday’s post, we used this marvelous Frozen Inspired Ice Castle Photo Backdrop from Artful Life Designs. With a bit of faux fur, fake snow, and “Let It Go!” playing in the background, we were ready to take some amazing photos! Both Princess Costumes were completed with matching Trick-or-Treat Tote Bags. 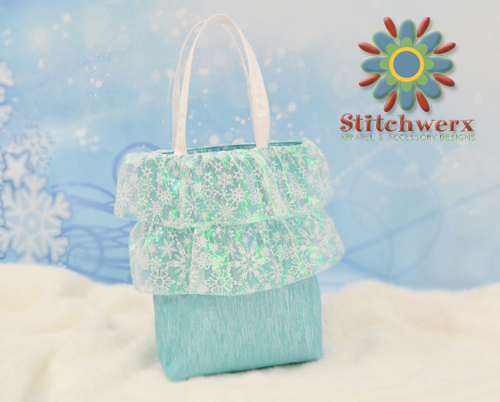 I modified my FREE One Simple Tote tutorial (by adding ruffles) to make quick and easy Frozen Inspired Trick or Treat Tote Bags. Yes, there is a Giveaway with TWO LUCKY WINNERS! You can gain entries by entering the Rafflecopter Prompts. Two winners will be chosen and announced on 9/15/2014. 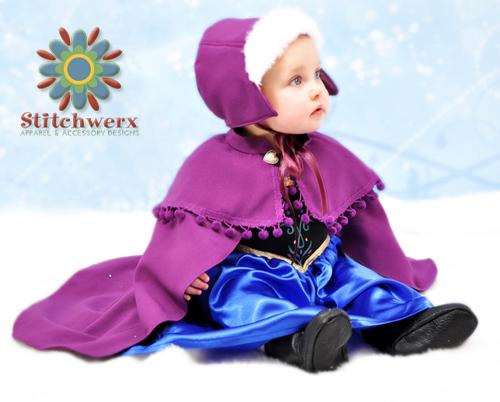 The Stitchwerx Designs Hat & Cape Pattern Bundle Sale continues through September 30, 2014! 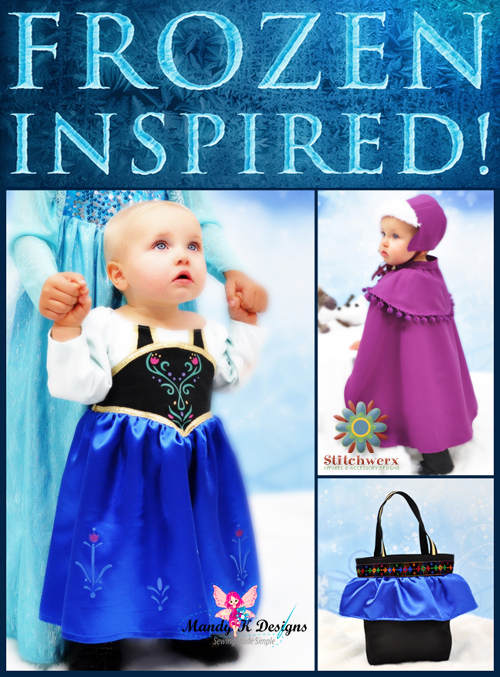 $10 for both patterns (to make the Princess Anna Inspired Hat & Cape). 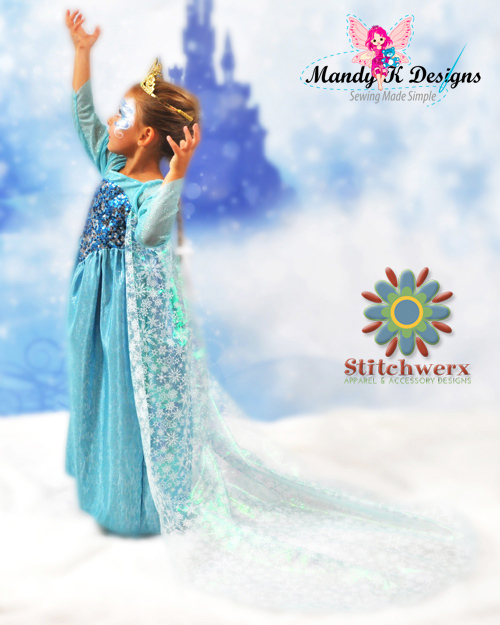 Thanks for stopping by & getting Frozen Inspired with Stitchwerx Designs and Mandy K Designs! For the past several years I have made my dear granddaughter a princess dress for Halloween & her birthday (which follows in December). Now I have two dear granddaughters, so this year it’s two princess dresses! Like so many, we have been inspired by the recent “Frozen” movie. 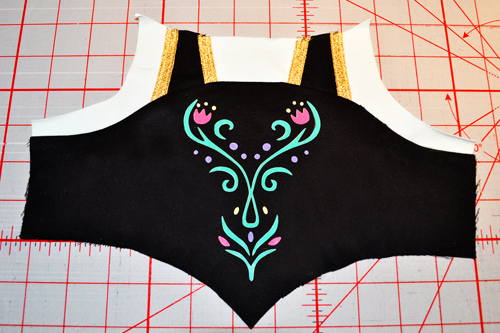 Going along with that, my post today is about creating your own Snow Princess Anna-Inspired Dress. We also have some goodies for you, so be sure to read all the way through!! Mandy K Designs is having a Limited Time Sale on this pattern of only $5 now through September 30, 2014. You can purchase that here: Princess Party Dress Pattern. For this dress, I wanted to use Scandinavian Motifs on the bodice and skirt similar to those on the dress Anna wears in the movie, so I drew my own. There are outline and full color versions. These are FREE (yes, FREE) templates for your personal use. Please don’t take my artwork and resell it! Even though these are designed to fit the Princess Party Dress Pattern, they could be used with just about any dress pattern. I used my Silhouette Cameo Software and ink jet printer to print the color motifs onto iron-on sheets for dark fabric, then cut them with my Cameo cutter. This iron-on stuff can be a bit tricky to use, but you will have good results if you take your time and follow the manufacturer’s instructions. I practiced on some scrap fabric first. You could also use the outline versions to cut stencil templates instead of doing the iron-ons. Since Anna’s dress has a black vest over a blouse, I wanted to recreate this look with my dress. This meant altering the pattern just a bit. It was very easy to do: I cut black shoulder straps and stitched those onto the top section of the dress on the front and back. 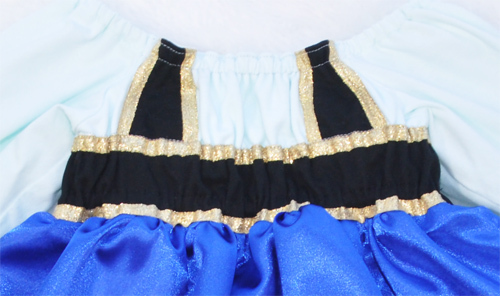 To complete the vest look, I used 1/2″ wide metallic gold ribbon as trim. Anna has a lovely hat and cape she wears to keep her warm in the Scandinavian winter weather. Our Snow Princess look would not be complete without these! I used one of my own pattern designs, the S138 Joyce Ann Bonnet, to make my Scandinavian Style Snow Princess Hat. 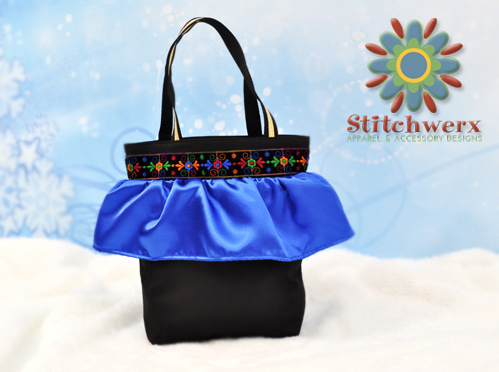 This pattern comes in 8 sizes to fit heads 15″ up to 22.75″. It has three views (a bonnet with two brims styles, and a fur-brim cap similar to Anna’s). The fur-brim version (View C in the pattern) worked perfectly for the Nordic Winter Cap look I wanted. I used my pattern, the S139 Traveler Cape, to sew the cape for my outfit. This cape comes in 5 sizes to fit 12M to 10Y. I added the pom pom fringe around the shoulder cap and some cute little heart buttons for a finishing touch. Today through Tuesday, September 30, 2014, you can purchase the Hat & Cape Pattern Bundle for $10 (35% savings off the individually priced patterns) in the Stitchwerx Designs Etsy Shop. 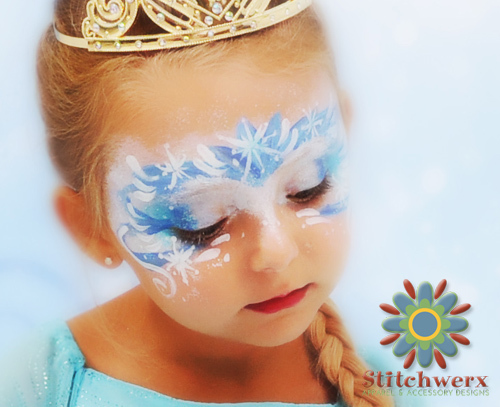 These patterns are not just for making a Snow Princess Costume, you’ll get good use from them making garments for everyday wear. 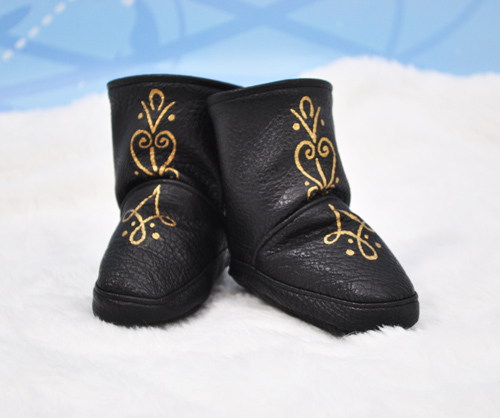 Download the Boot Motif Template to stencil your own Anna-style Scandinavian Boots. 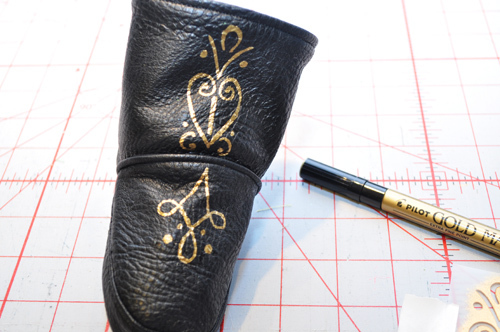 You can transform plain black boots using the FREE Scandinavian Boot Motif Template and metallic gold paint or pen. My granddaughter has tiny size 4 feet, so I decided to make boots for her. I am still working on grading and releasing a boot sewing pattern. I’ll be sure to post all about it once it comes to fruition! 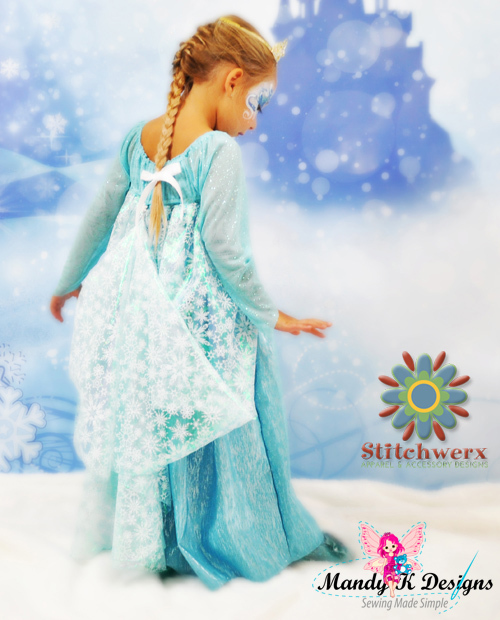 We had a great time photographing the girls in their Frozen Inspired Princess Costumes. 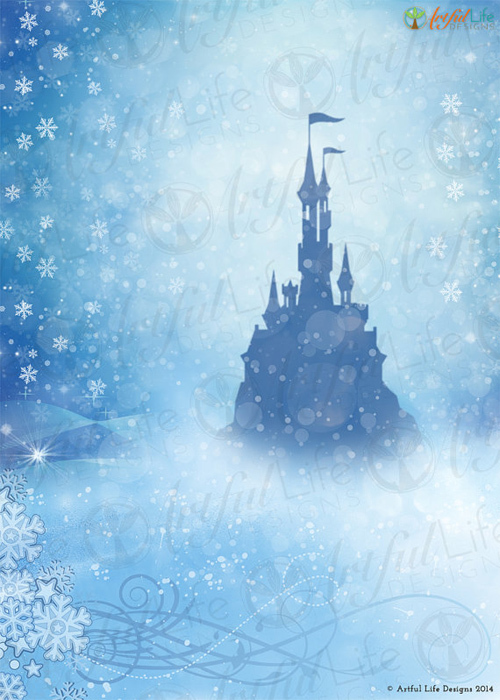 I LOVE this Frozen Ice Castle Photo Backdrop from Artful Life Designs! It is available for purchase in sizes ranging from 3′ x 3′ up to 5′ x 7′. This is the perfect photo back drop for any “Frozen Inspired” Birthday Party, Event or Photo Shoot! It’s exhausting being a Snow Princess! No Snow Princess Costume would be complete without a Trick-or-Treat Tote Bag. I modified my FREE One Simple Tote Tutorial (by adding ruffles) to make quick and easy Frozen Inspired Trick- or-Treat Tote Bags. 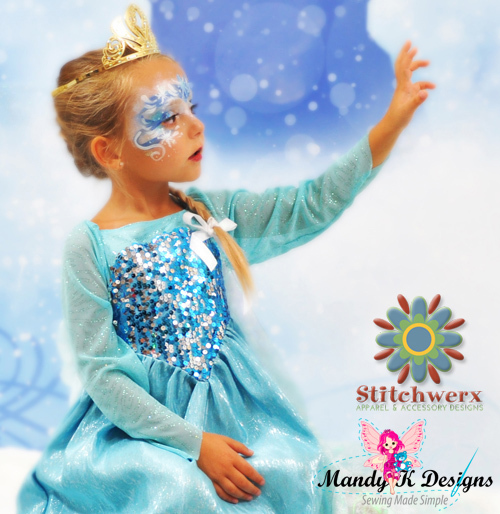 Thanks for stopping by and getting “Frozen Inspired” with Stitchwerx Designs and Mandy K Designs! 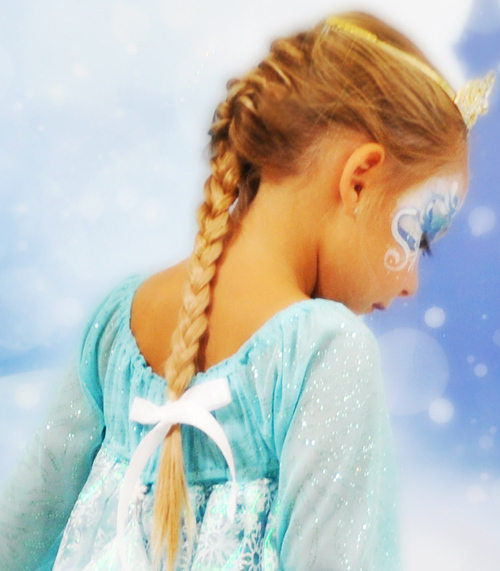 Frozen Inspired Part Two-Ice Princess Elsa Dress.